The Chicago Blackhawks will have an important name on the lineup card tonight, as Corey Crawford will make his first start since mid-December. Crawford was activated from injured reserve yesterday while Collin Delia was returned to the minor leagues on Monday in time to retain AHL playoff eligibility. Crawford, 34, started 23 games for the Blackhawks after returning from a long concussion-related absence and posted a .902 save percentage. That number was trending upwards when he suffered another concussion on December 16th when a player collided with him. Crawford’s head impacted the post of his net and given his history with head injuries he was immediately removed for testing. The fact that Crawford is returning at all this season is almost miraculous, but given the current state of the Blackhawks it couldn’t come at a better time. Despite sitting in last place in the Central Division the Blackhawks are still just six points behind the Dallas Stars for the final Western Conference wild card spot. If the team is to have any hope of snatching that final playoff position, Crawford will have to be at his best. The team has been carried by an outstanding season by Patrick Kane and the immediate chemistry between Alex DeBrincat and Dylan Strome, but need better goaltending to really compete in the playoff picture. While Delia made an admirable debut and showed he may have a future in Chicago, the team has a combined .894 save percentage on the season, tied for 29th in the league. Winnipeg Jets fans can breathe a sigh of relief when they learned that defenseman Dustin Byfuglien will be out Saturday in their game against the Ottawa Senators as head coach Paul Maurice indicated that the injury is a minor one and is in no way related to the ankle injury that kept the 6-foot-5, 260-pound blueliner out of 15 games earlier this season, according to Paul Friesen of the Winnipeg Sun. Winnipeg doesn’t play another game until Wednesday and Maurice believes that Byfuglien should be ready to return for that game in Colorado. With the loss of Joseph Morrow, the Jets will be shorthanded on defense, although Sami Niku was recalled earlier today to step into the lineup. Jason Lieser of the Chicago Sun-Times writes that goaltender Corey Crawford has been cleared to return to the ice after sitting out for the last two months with another concussion. However, the team wants to be cautious before throwing him back in and won’t activate him for Saturday’s game. Lieser reports the team is considering putting him in the lineup on Monday when the host Ottawa, setting the veteran up with an easy home matchup to ease him back into the lineup. Crawford’s return could also force Collin Delia to return to the AHL despite faring well since being recalled. When the Boston Bruins snapped the Chicago Blackhawks’ winning streak at seven games last night, it brought to light how little the run actually meant in the bigger picture. The Blackhawks have certainly improved in the second half, but are still on the outside looking in by a substantial margin. Even after stockpiling points over the last few weeks, Chicago is currently 12th in the Western Conference and virtually tied with the Edmonton Oilers in points percentage, who trail by two points but have two games in hand. The Blackhawks are four points behind the Minnesota Wild in for the final wild card spot and would have to leapfrog three more teams to get there, two of which hold games in hand, too. The upcoming schedule for the ’Hawks is light; it features five home contests and six non-playoff teams out of eight games. However, the schedule is not as easy the rest of the way. If management takes another small stretch of success before the deadline to mean that the team should not be sellers this season, it could be a mistake. Given that Chicago’s top rentals are not imperative to winning anyway – Marcus Kruger, Chris Kunitz, Andreas Martinsen, Cam Ward – the best and most likely course of action will be for the Blackhawks to entertain all trade offers over the remaining days before the deadline and not engage in any buyer talk. The Blackhawks announced today that center David Kampf has been placed on injured reserve. Although the placement is retroactive to February 5th, do not expect Kampf back soon. NBC Sports Chicago’s Charlie Roumeliotis notes that the timeline to return is three to four weeks, making a reappearance by Kampf before the end of the month unlikely. Kampf has 16 points in 50 games for the Blackhawks this season and has been a solid bottom-six forward for the team in his second year since making the jump from Europe. 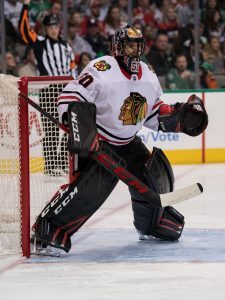 The silver lining to Kampf’s injury, as Roumeliotis points out, is that it opens up a roster spot for goaltender Corey Crawford to potentially make his return. Crawford has reportedly been getting close to game readiness and after missing the past two months while battling concussion symptoms. 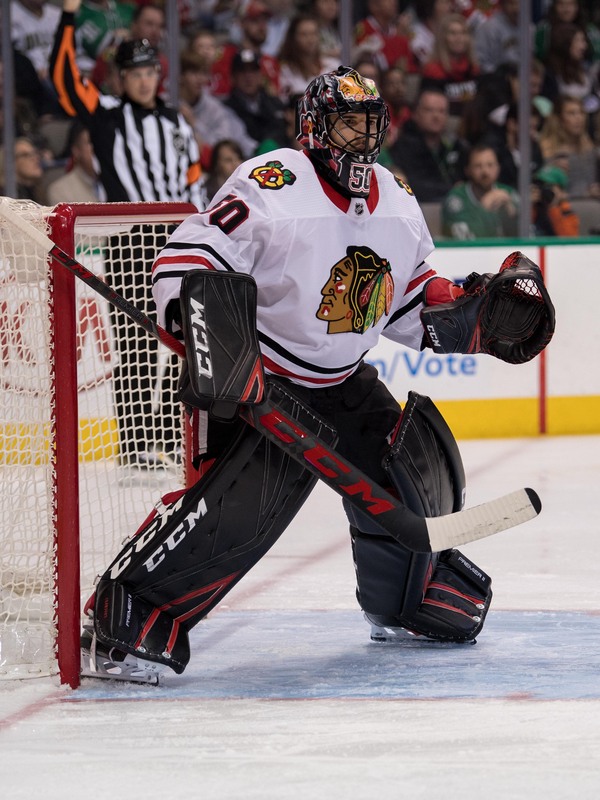 If Crawford is able to return and at least show that he is capable of splitting time with rookie Collin Delia, that would give the Blackhawks even further encouragement to peddle veteran backup Ward before the deadline rather than carry three goalies. Luc Snuggerud worked quickly to find a new team after his contract was terminated by the Blackhawks on Monday. The young defenseman has signed with a rather obscure club, the Stavanger Oilers in Norway. The team announced a contract for the remainder of the season with Snuggerud. While hockey is growing in Norway, the national pro league is not considered to be among the elite in Europe. In fact, on the entire Oilers roster, including eight North American skaters, only Greg Mauldin has any NHL experience. As such, Snuggerud is expected to step in and make an immediate impact for Stavanger, which is what he was unable to do in the Blackhawks organization. The Hurricanes have shown an interest in Penguins goalie prospect Tristan Jarry in the past, notes Jason Mackey of the Pittsburgh Post-Gazette. With Pittsburgh signing Casey DeSmith to an extension recently, Jarry’s name has come up as a speculative trade candidate between now and the February 25th trade deadline. Carolina’s top two goalies at the moment in Curtis McElhinney and Petr Mrazek are both slated to become unrestricted free agents this summer so it wouldn’t be too surprising to see the Hurricanes circle back on Jarry at some point over the next month. Kevin Shattenkirk has fared better in recent weeks compared to his tough start to the season. With that in mind, Larry Brooks of the New York Post suggests that this stretch may give the Rangers an opportunity to trade him. The 29-year-old hasn’t lived up to his four-year, $26.6MM contract signed back in 2017, one that has two years remaining on it. However, he has been a quality point producer before his time in New York and with teams looking for help on the right side, there may be an opportunity to get out from under his deal (or at least most of it). Shattenkirk has a no-move clause in his deal as well as a 10-team no-trade list. While the Red Wings are believed to be likely to move some of their pending unrestricted free agents, GM Ken Holland indicated to Helene St. James of the Detroit Free Press (video link) that he’s open to moving anyone that isn’t part of their young core (which likely includes winger Anthony Mantha plus centers Dylan Larkin and Andreas Athanasiou) or future assets such as prospects and draft picks. Detroit wound up making a deal of significance involving a player like that last season when they moved winger Tomas Tatar to Vegas and since they have several other veterans on long-term deals, it wouldn’t be surprising to see them try to go that route again. With Corey Crawford resuming on-ice drills as he works his way back from a concussion, Jason Lieser of the Chicago Sun-Times mentions that there will be a roster logjam when he’s cleared to return. The team thinks highly of youngster Collin Delia and likely won’t want to return him to Rockford of the AHL while Cam Ward and his no-move clause is also on the roster. Assuming Crawford gets the green light to return before the trade deadline, it wouldn’t be surprising to see Chicago ask Ward to consider waiving his clause to accept a trade somewhere else. The Dallas Stars made the news Friday when Dallas Stars CEO Jim Lites went on a rant due to the poor play of franchise stars Jamie Benn and Tyler Seguin. The must-read rant suggests that ownership is not happy with the duo’s production and expect to see immediate changes on the ice. In hopes of getting more answers and whether ownership is ready to make some major changes regarding those two players or whether general manager Jim Nill’s job is in jeopardy, Sportsnet’s Elliotte Friedman interviewed owner Tom Gaglardi. While Gaglardi made it clear that the franchise hopes to impart the importance of turning their season around now, Friedman believes that major changes are coming if the team fails to make the playoffs again. The Stars are currently in fourth place in the Central Division with a 19-16-3 record and 41 points, just two points in front of Minnesota. The Vancouver Canucks, in the Pacific, are one point out of that wildcard spot with 40 points. The Winnipeg Jets have to hold their breath after Dustin Byfuglien went down with an apparent leg injury during the third period of Saturday’s game against the Minnesota Wild and didn’t return. Winnipeg head coach Paul Maurice had no update on their star blueliner after the game, according to Sportsnet’s Emily Sadler. The 6-foot-5, 260-pound defenseman collided with Minnesota’s Luke Kunin midway through the period and replays show that Kunin’s leg collided with Byfuglien’s knee. The 33-year-old is having a solid season, posting four goals and 29 points in 32 games. Any long-term loss could be crippling for a team that is trying to hold off both Nashville and Colorado in the Central Division.